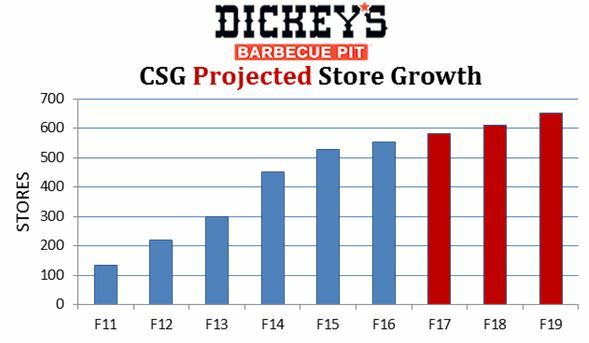 CSG Snapshot: Dickey's Barbecue Restaurants Inc.
President + CEO: Roland Dickey, Jr. The largest BBQ chain in the US keeps getting bigger. From a few dozen restaurants in 2006 when current CEO Roldan Dickey, Jr. stepped to the forefront, Dickey’s Barbecue Restaurants, Inc. has grown by leaps and bounds through aggressive franchising efforts. 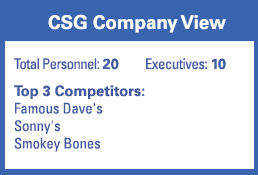 The company is poised for continued growth at a substantial yet measured clip in the near term with an impressive portfolio of signed franchise agreements on file and more to come. Historical Data Source: Chain Store Guide’s Chain Restaurant Operators Database. Estimated growth is based on proprietary trend analysis. Actual figures are subject to change. This data is not intended for investment decisions.